Start with the premise that someone who consistently wins elections for close to three decades is good at it. Quite a few people were surprised and angered when the city council chose to appoint Lindsey Horvath to replace Sal Guarriello. She was so new to the city, with so little experience in local government. Other applicants for the seat were well known to the community, knew their way around local government, and had spent many years serving on city commissions. And Horvath had a recent-enough published record of Bush-is-awesome political sentiment that was just waiting to be turned up by anyone who knew how to use Google, probably a fatal fact in a West Hollywood election. How could they make such a weak choice? How could they be so tone deaf? 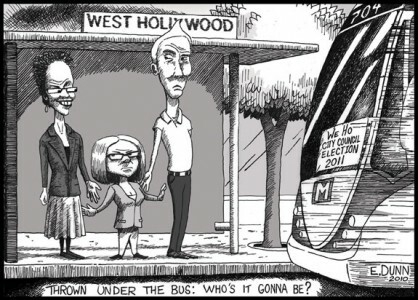 Editorial cartoon posted on the website of city council candidate Mito Aviles. In the spring of 2009, with an election less than a year away, what choice would most benefit John Heilman and Abbe Land? West Hollywood has at-large elections for city council seats. In 2010, the three candidates drawing the largest number of votes would win seats on the council. If a strong challenger entered the race and ran an effective campaign, one of the three incumbents on the ballot could be displaced. If Heilman and Land wanted to run again, and the appointee could reasonably be expected to try to hold the seat with an election victory, success for a challenger had to mean defeat for an incumbent. And no way did two experienced politicians not know who was going around town talking about getting into the race, so they had at least a pretty good sense who they would be up against. They knew a tough race was coming. If you’re Heilman and Land, and you find yourself in that position, do you pick the strongest possible candidate? If you do, you’ve chosen someone who has a serious shot at hanging on to a council seat. In that case, a strong challenger can only knock one of two people off the city council: Heilman or Land. But if you pick a weak candidate, with no developed base of local support and no experience running for office, a strong challenger has a weak incumbent to bump. You’ve laid a shock absorber between your seat and a voting public known to be in a foul mood. Then if you’re lucky enough to have six challengers to split the anti-incumbent sentiment, and you have some friends who are willing to muddy the waters with some confusing mailers — a real estate developer, say for example, who’s willing to attack a challenger for being in bed with real estate developers — you can pull victory out of a community that no longer finds you all that thrilling. It’s ugly enough to be elegant. How many times can someone be this tough, this shrewd, this dirty, and this lucky? Quite a few times, apparently. We’ll know for sure on Monday afternoon. Chris Bray is a PhD candidate at UCLA, and a former soldier and journalist. He has lived in Weho for eight years. I don’t know how Lindsey feels right now, if she is just trying to put on a good front, but I personally feel sorry for her. I hope she has not been hurt or even scarred for life by this rough and tumble experience put on her by self serving people who were only looking out for thier own good and greed, people on the city council who I feel have only added to the feelings of many that they are not nice, maybe even awful, people… and phony for sure. I can’t help but think it is hurtful and demoralizing to be used in such a way and then face such rejection. I feel sure Lindsey will move on to a more dignified and rewarding place in life as she is very capable. It’s amazing the power grab that certain of them have gotten away with for so long. I think their time is up next election and hopefully they will have the good grace and class to move on without being pushed out as Lindsey was, thanks to them.